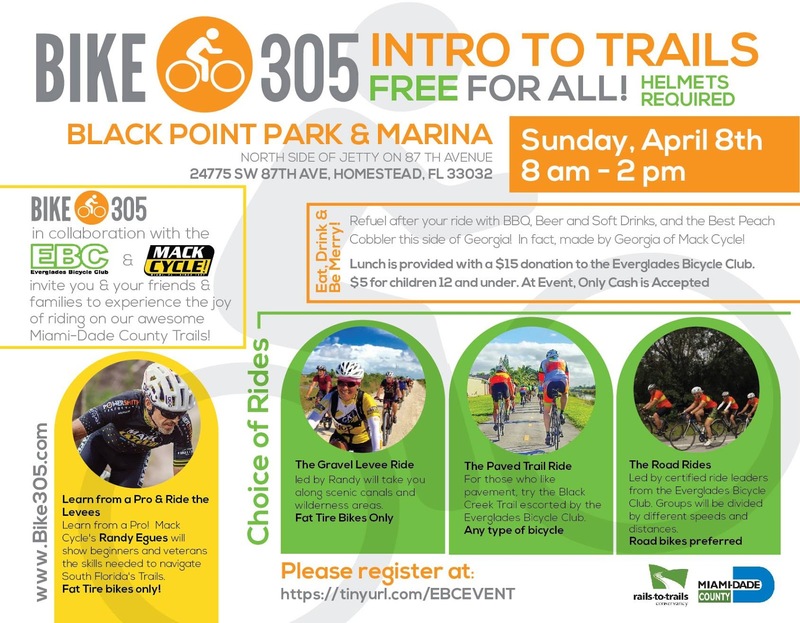 "Join Everglades Bicycle Club for their annual EBC Picnic & BBQ in collaboration with Miami-Dade Bike305. They will have a special emphasis on experiencing the joy of riding on Miami-Dade County trails. In light of continuing crashes between cyclists and motor vehicles, the "Bike District" Commissioner, Daniella Levine Cava, is announcing the formation of the "DEAD SERIOUS Task Force" to effectively reach and bring together drivers, cyclists, and law enforcement. The Commissioner's announcement and dedication of the the "Ghost Bike" will take place at 10:30 am at Black Point Park after the scheduled Bike305 and Everglades Bicycle Club rides. The event will include fantastic rides, both trail and road rides, and then, as usual, have great food after we ride." Learn from a Pro & Ride the Levees! Mack Cycle's Randy Eques will show beginners and veterans how to navigate South Florida's gravel tr and take you on a scenic ride along the canals. Fat Tires only. Ride the Road! Join one of the Everglades Bicycle Club's road rides with speeds from 14 mph to 20+mph for short or longer distances. Road bikes recommended. Take the Trail: For those who like pavement, try the Black Creek Trail escorted by the Everglades Bicycle Club. Any type of bike can be used. "Bike District" Commissioner, Daniella Levine Cava, is announcing the formation of the "DEAD SERIOUS Task Force" to effectively reach and bring together drivers, cyclists, and law enforcement. Following the announcement will be the dedication of a ghost bike. Eat, Drink & Be Merry! Refuel after your ride with BBQ, Beer and Soft Drinks, and the Best Peach Cobbler this side of Georgia! In fact, made by Georgia of Mack Cycle!